Got a pot of ragu simmering on the stove for Sunday dinner, the wife's making pasta and jamming out to Turandot (no, I didn't know what it was called without looking at the Pandora feed...I only remember it as the music playing when the good guys sign a peace treaty and the bad guys all get whacked at the end of "The Sum of All Fears" in a relatively heavyhanded example of cinematic juxtaposition). I figure there's no better time to get BD in Dupont again. 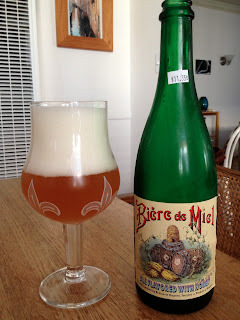 Apparently Biere de Miel likes Italian opera a lot because the head exploded even though I poured it pretty gently. And then I had to wait 10 minutes before I could drink it. I hate it when that happens. Dupont strikes gold again (do they ever not?) with the nose. Nice Belgian funk, but not in a nostril-stripping way, and some lightly green (and incredibly fresh-seeming) hoppiness that's almost pilsnery. Behind that is a nice honeyed sweetness- which is supposed to be there, of course, given that Miel translates to honey. I'm so glad I picked Dupont for my BDS. Because I feel lucky every time I get to drink one of their beers. This is absolutely delicious. Just a perfectly balanced, light-bodied, carb-poppy refreshing saison- right in line with the other Dupont efforts in that respect. 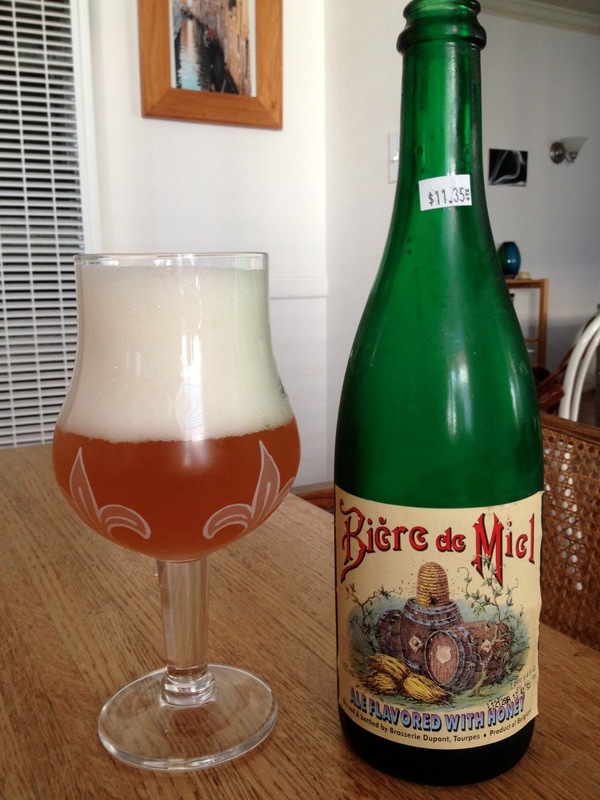 Where this differs, though, is the honey (again, as it should, because otherwise why call it Biere de Miel?). It provides a bit more richness than the other Duponts I've sampled, taking the beer slightly in the tripel direction. I also feel like it's a touch sweeter than the other ones, though it's been long enough since the last one that I could be making that up. And it's strange- every time I go to take a sip, I keep smelling and tasting something that's almost like spearmint toothpaste at the very end. I know that probably sounds awful/hallucinatory (the wife confirmed it, so I don't think it's the latter), but I'm pretty sure it's just a random confluence of scents and flavors, and given that it's sort of an entertaining bit of complexity. Not off-putting in the slightest. Anyway, in the end, this beer comes off like a really interesting hybrid- a German pilsner somehow made with Belgian ale yeast. Obviously that's not something that exists in the real world, but if you want to taste what it might be like, go grab a bottle of this. This BDS keeps getting better and better. Well, for me, at least. I think this is my favorite Dupont yet. Once I have more space, this may become one of those always-in-the-fridge beers. Unless of course it's topped by one of the several other Duponts I have to work on, which isn't necessarily a long shot.